After a wonderful sightseeing tour of the havelis, temples and fort of Jaisalmer I and my three friends were all set to enjoy the colourful Desert Festival. 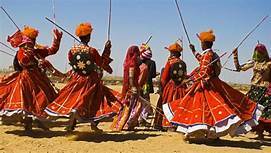 It is the most vibrant festival of Jaisalmer celebrated every year in Jan/February. Attracting visitors from far and wide, this festival is organised by the Rajasthan State Tourism Corporation. A mirror to the rich cultural heritage of Rajasthan, the festival is marked by several wonderful cultural activities. When we reached the venue of the festival I felt as if the desert has come alive with the celebration of this festival. 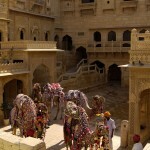 The sight of the decorated camels and rajasthani men and women in colourful attires was simply appealing. 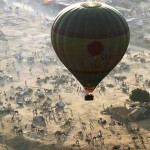 The festival offers an opportunity to tourists to acquaint themselves with the culture of the land of raja-maharajas. I interacted with some local people who told me a lot of things about the Rajasthani culture. The first event that we saw was the turban tying contest. I was really amazed at the speed with which the participants were tying the turbans. It is a very much part of their tradition and no wonder they have long perfected this art. The other events that we saw were camel race, Mr. Desert contest and dance performance. The fire dance is one of the striking features of the festival. It is performed on a ground covered with wood and burning charcoal. The performers walk through the fire in rhythm with the beats of drum. We were spell bound at the sight of the performers who were not at all affected by the flaming coals. Another breathtaking experience was the finale of the festival. It was marked by the mesmerizing light and sound show amidst the sand dunes on a moonlit night. I felt as if I had been transported to a storybook of a desert. We also bout some fine handicrafts from the stalls such as wood and stone carvings and embroidered leather bags. 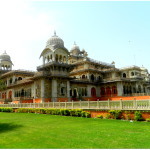 «Next Post Palace on Wheels Tour- Recapturing The Royal Era!